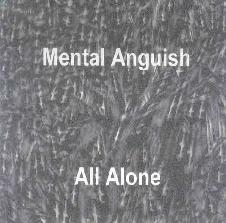 Mental Anguish - "Particles" / "Second Ashtray To Dawn" / "Drifter" / "Psykokinesis" / "All Alone"
Here we have five CD's of varied and wonderfully strange spaced out electronic fun from Chris "Mental Anguish" Phinney, veteran of the homemade music underground scene and head of the long running Harsh Reality label. Throughout these 5 discs, Chris creates a banquet of cosmic delights, many of which are remix tracks with contributions from Chris' cohorts in The Tapegerm Project (see review this issue of 5 volumes of Mental Anguish Tapegerm Mixes). 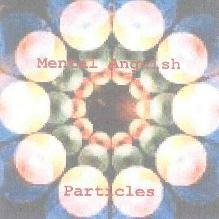 There's lots of dance music on Particles and it's some seriously cosmic freaky stuff. Head boppin', toe tapping, space rave for robots dance grooves that will make your body move, despite the fact that the floor is no longer under your feet. If you can make the leap from the Ozrics to Eat Static then you'll dig this stuff. Chris knows how to lay down a solid groove while mixing and mashing loads of cool freaky elements and carefully implanting them into the cranium of the music such that all the little alien bits fuse together seamlessly. Of course there's lots of fun voice samples and miscellaneous sound fun scattered about. Some tracks have a fuller cinematic feel, and there are a couple of peacefully spacey orchestral moments too. Kind of like Vangelis at a rave. We also have some off-kilter blends of experimental sound-art collage and spaced out dance weirdness, and spacey, darkly atmospheric avant-garde sound texture pieces that have an ominous horror flick soundtrack feel. "Police State" is a standout track that starts off like one of the more sound-art oriented tracks, but soon incorporates dancey tribal elements. Chris really excels at bringing together a multitude of disparate elements in creatively strange ways and makes them all fit together like peas in a solar pod. "Sad Sad Life" is another one that grabbed me, bringing to mind Klaus Schulze meeting Isaac Stern on the soundtrack set for a John Carpenter film. "Night Row Hex Poser" was a bit of a shocker, smacking me around like an Industrial-Noise dance assault. Pretty wild. But I think my favorite tracks were "Krank" and "Catalyst". "Krank" is a killer slab of completely whigged out space weirdness. I can't even begin to describe it. Imagine a big whopping stew of Chrome and The Residents glommed together in a sort of avant-prog rock electro space groove. Yeah... freaky. And "Catalyst" is deep in space and completely alien, but includes a full potent keyboard sound that I enjoyed, as well as several off the beaten path twists and turns along the way. On Second Ashtray To Dawn we've got more of the cosmic dance grooves that were such highlights of the Particles CD. Honestly, Chris has developed into a real craftsman with this stuff. He puts a witches brew of pieces together, taking just the right amounts of carefully organized chaos and skillfully molding them into finished tracks that are totally out there yet completely linear and controlled. "Hungry Waters" is an excellent example of his off-kilter approach to rhythm and sound. It's spaced out, it's freaky, it's dance music... but just you try and dance to this and see what happens. Twister anyone?!! Other standout tracks include the alien jazzy barn dance vibe of "Skunk Butter Brotha". Is that Wes Montgomery on guitar? I love the space funk grooves on "Post Hypnotic". "Plateaus Of The Dead" is like a Mental Anguish space dance interpretation of the Peter Gunn theme. 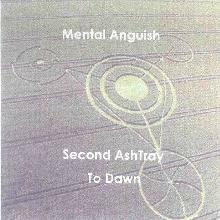 "Second Ashtray To Dawn" is a vocal track that sounds like Mental Anguish resurrecting the Eurythmics. There are also several tracks with a cool industrial dance vibe. "Friday's Hebephrenic" sounds like it could be an old Pressurehed song. "Land of Nod Remix" is similar but has a dark Gothic vibe and menacing vocals. "The Thirst" is one of the more relaxed and mind massaging space voyages of the set. And "The Attack of the Repression Remix" is one of my favorites, being a killer electro fueled Space Rock track. Earth is under attack! Run for cover! Call Homeland Security! 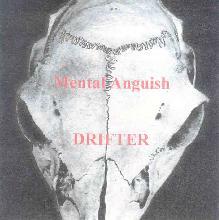 So far Drifter would seem to be the ultra cosmic, high energy rhythm and groove album of the batch I've got here. The first 6 tracks are the space rave instrumental title track, plus 5 remixes that build upon the basic repetitive bubbling beat. It's actually pretty interesting hearing these tracks in succession. So much of Chris' music consists of remixes and using loops in creative ways. So it's revealing to hear how much can be done with a single idea, especially for those of us who sit back and zone out to the results rather than participating in the creative process ourselves. And the rest of the album follows with variations of similar themes. My favorites are the ones (most of them really) having a head pounding rave beat and oodles of spaced out pieces and layers that once again achieve an impressive balance between rhythmic pulse on the one hand and outer limits brain candy on the other. "The Other Kids" and the AutoCad Remix of the same are standouts, the former sounding like a symphonic space-prog dance tune and the AutoCad Remix adding a spaced out action drama soundtrack theme feel to the music. "Baby Madisons Song" is an interesting track that has a cool Oriental theme, but also explores darker realms. And "Black Night" struck me as being like some kind of hyper-kinetic Vangelis piece. 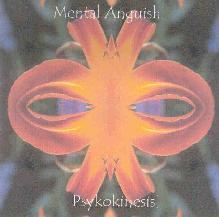 Psykokinesis is a collection of mostly remixes by Chris of other artists' music and others remixing Chris' music. We've got ethereal chill-out grooves, bubbling and grooving alien fun, and much more. Highlights includes "Artoteq", a cool combination of chill-out grooves and peaceful lulling melodies. "Molten" consists of haunting alien atmospherics with a spaced out avant-garde soundtrack feel. I liked the two different mixes of "A Spaceman, A Rainbow". The "Cruel Mix" features cool robotic jazz grooves while the "Dark Ambient Mix", as the title suggests, largely removes the grooves and adds a dark and somewhat harsh ambience to the music. "Helplessness" and "Chillsolence" are a couple of excellent freak-pop tunes. "Insolence" is a heavy electro space rocker that I enjoyed. And Chris even dives into the heavy metal arena on three remixes of the song "Recluse". The basic track is a metallic rocker with an industrial edge. The "Hermit Mix" is a freaky spaced out electro groove metal tune. And the "Dirt Misshapen Mix" fried my brain with its grinding metal against electro jazz grooves. What a wild contrast. Definitely one of my favorites of the set. All Alone took me a little by surprise and is probably the most varied and different set of the bunch. Chris warms up our ears with a short, high energy, head groovin' dance rocking track, before launching into "Hubris", a very interesting tune that I can only describe as ‘industrial drift". It's got a sort of Krafwerk sound at times, but it also has subtly shifting minimalist waves, dreamy atmospherics, alien synth embellishments and an intermittent dance beat. I really like the way it evolves and morphs continually throughout its 9 minute length. "All Alone" is very different. It's a vocal track with a singer that brought to mind a cross between Kate Bush and Dagmar Kraus. The music is lead by an emotional piano melody and accompanied by spacey synth washes. Very nice. Maybe like a spacier and less dissonant take on the old Art Bears sound. "Drifter-Livin' Outta The Sack-toda_v Mix" is a 16 minute workout that begins with a calm spacey drift, but it's also got these quietly pounding bass blasts that sound like those Japanese movies where you hear Godzilla's footsteps approaching in the distance. Nice effect. Percussion and sound is gradually added, and it ultimately settles into a combination of floating dreamy space, ever-shifting rhythmic patterns, and mutating noise textures. A very cool blend of spacey mind massage, aggressive sensations and cool grooves. "Nitros Mask Hypnosis-John Dante's Analog Sins Mega Mix" is another lengthy track that employs the DJ to give a rhythmic kick to the space journey. "Radio Railhead" is a heavy driving industrial rocker, parts of which remind me of Bill Nelson in his initial post-Be Bop Deluxe days. We've also got an AutoCad Mix of the same song that adds a funky twist to the original. "Insolence 2" is a fun tune that mixes 80's electro-pop melodies with the trademark Mental Anguish rhythmic pulse. And it's a riot when the military trumpet kicks in. And finally, "Flares" is an excellent spaced out robot rocker that closes the set on a head groovin' note. Wow, does that sound like a fun and freaky batch of electronica? I agree... now go check out the other things this man has his fingers in by reading the Mental Anguish Tapegerm Mix, Planet 0 and collaboration with Nomuzic reviews, also in this issue. For more information you can visit the Harsh Reality web site at: http://www.harshrealitymusic.com.